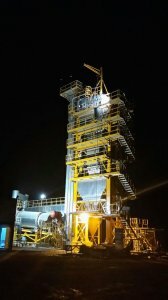 SGM 240.H model PRIMA type SIGMA asphalt plant with 240 tons/hour capacity was started up in Silopi/ Turkey. This is the fourth SIGMA plant purchased by the same group in last five years. The plant was designed to operate with liquefied natural gas (LNG), however the dual burner is capable of burning liquid fuels (such as heavy oil) too. Also equipped with automatic fibre dosing system for stone mastic asphalt production and bitumen tank agitators for polymer modified bitumen application, the plant was commissioned in August 2014. Since then, the plant is operating successfully with excellent performance.